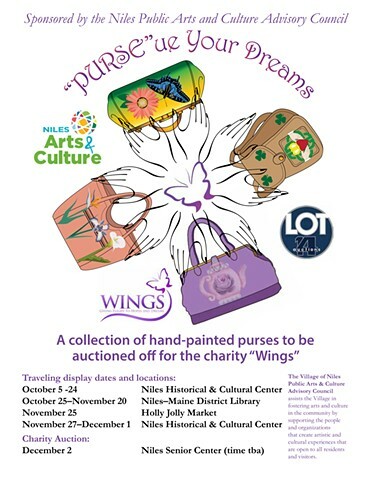 “PURSE”ue Your Dreams is a collection of purses, painted by over 20 local and professional artists, which will be on traveling display around the Village of Niles. This event will benefit the charity WINGS, which provides housing, integrated services, education and advocacy to help end domestic violence. The final auction is December 2, 2017 at the Niles Senior Center. The illustration and design work done for this event are my donation. From January 2 until January 8, 2017, I became the first scheduled artist for the Goldmoor Inn artist-in-residence program (top left). There were 4 artists scheduled to stay each week in January and record their impressions of the Inn and surrounding community, with a 1 day workshop being offered at the end of each week. 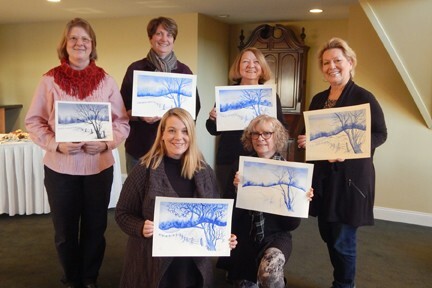 The workshop I conducted was for students new to watercolor painting as an encouragement to begin the new year by trying a new skill. I have never had more appreciative and happy students than those that participated, and I thank you all for a wonderful experience! Kosart Effects Studios & Gallery in Westmont is excited to continue Chicago’s newest Halloween tradition with the Fourth Annual MALEFICIUM Dark Art Exhibition, the Halloween-themed art show open to the public and free to attend. A public art project with the goal of raising funds for charity at the "Night of Roses" auction in November 2014. Oil paintings and drawings on exhibit at the new Art Gallery at the Oremus Art Center at Lewis University. Closing reception is Thursday, April 25, 2013 in the evening. Public is invited. Chicago Cultural Center Solo exhibition of paintings and drawings in a show titled "Vestiges." Renaissance Court Gallery June 13 through August 26, 2012. Public reception Friday, July 13 from 5:00 until 7:30 p.m. Artist Gallery Talk Wednesday, August 1st at 11:30 a.m. The theme of the Field’s Project is “Bringing Art and Agriculture Together,” and all invited artists will be living with farm families on working farms for the duration of the event. Carol is one of the 3 field sculpture artists selected who created designs that will be mowed by farm tractors into a 450’ X 600’ field, with final results viewable from the air. Her design incorporates an art deco influenced stalk of corn, titled Homage to Illinois Corn. It is her 3rd time to participate, and first as a field sculptor. The public is invited to view the field sculptures as airplane rides are conducted on the last two days of the event. For plane ride reservations call 815-732-3324. Check out the NBC video featuring the 10 "Pigs on Parade" created as a fundraiser for an elementary school in Lemont, Illinois. As part of the Chicago Artist's month festivities (October 2007), the Illinois Institute of Art Chicago's Gallery 180 exhibited juried work the school reserves the first option to acquire. My oil painting, "Sonisa del Sol," was one of the exhibited works and was purchased for the permanent collection. Cool Globes was a public art project along Chicago's lakefront the summer of 2007. Click on Read More for the entire article. PLEASE NOTE: The last on-site viewing of all the Cool Globes was September 28th. Several globes were auctioned on Friday, October 5th at the Auditorium Theater fundraiser. Gracie Greenroof was purchased by Tecta America, which is working with the city of Chicago Parks District to place her in a permanent location.